The two batteries of Patriot missiles are meant to protect Turkish territory from potential Syrian missile attack. INCIRLIK AIR BASE, Turkey — The U.S. will send two batteries of Patriot missiles and 400 troops to Turkey as part of a NATO force meant to protect Turkish territory from potential Syrian missile attack, the Pentagon said Friday. Defense Secretary Leon Panetta signed a deployment order en route to Turkey from Afghanistan calling for 400 U.S. soldiers to operate two batteries of Patriots at undisclosed locations in Turkey, Pentagon press secretary George Little told reporters flying with Panetta. Germany and the Netherlands have already agreed to provide two batteries of the U.S.-built defense systems and send up to 400 German and 360 Dutch troops to man them, bringing the total number of Patriot batteries slated for Turkey to six. The German Parliament is expected to formally agree to the deployment on Friday. NATO foreign ministers endorsed Turkey’s request for the Patriots on Nov. 30. A number of Syrian shells have landed in Turkish territory since the conflict in the Arab state began in March 2011. Turkey has condemned the Syrian regime of President Bashar Assad, supported Syrian rebels and provided shelter to Syrian refugees. Ankara is particularly worried that Assad may get desperate enough to use chemical weapons. 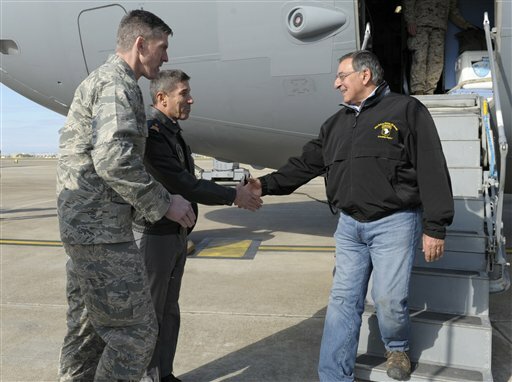 During a brief stop at Incirlik Air Base, Panetta told U.S. troops that Turkey might need the Patriots, which are capable of shooting down shorter-range ballistic missiles as well as aircraft. He said he approved the deployment “so that we can help Turkey have the kind of missile defense it may very well need to deal with the threats coming out of Syria,” he said. “It will not support a no-fly zone or any offensive operation. Its aim is to deter any threats to Turkey, to defend Turkey’s population and territory and to de-escalate the crisis on NATO’s south-eastern border,” Lungescu said. Panetta did not mention how soon the two Patriot batteries will head to Turkey or how long they might stay. Earlier this week in Berlin, German Deputy Foreign Minister Michael Link told lawmakers that current plans call for the missile sites to be stationed at Kahramanmaras, about 60 miles north of Turkey’s border with Syria. Dutch Prime Minister Mark Rutte said Thursday that the Netherlands, Germany and the U.S. are working closely with Turkey “to ensure that the Patriots are deployed as soon as possible.” But he predicted they would not become operational before the end of January. Turkey joined NATO in 1952, three years after the alliance was formed. At Incirlik Air Base, about 60 miles north of the Syrian border, an Air Force member asked Panetta what the US would do if Syria used chemical or biological weapons against the rebels. Panetta said he could not be specific in a public setting, but added, “we have drawn up plans” that give President Barack Obama a set of options in the event that U.S. intelligence shows that Syria intends to use such weapons. Asked by another Air Force member whether he thought Syria would “react negatively” to the Patriot deployments, Panetta said, “I don’t think they have the damn time to worry” about the Patriots since the regime’s leaders are struggling to stay in power. He indicated that Syria’s reaction to the Patriots was not a major concern to him. Separately, NATO will deploy its Airborne Warning and Control System aircraft, or AWACS, to Turkey on a training exercise this month, said a NATO official who spoke on condition of anonymity because alliance rules do not allow him to speak on the record. He said the exercise was not connected to the deployment of the Patriots. The aircraft, which can detect launches of ground-to-ground missiles, will exercise command and control procedures as well as test the connectivity of various NATO and Turkish communications and data sharing systems, the official said.